Forrested area with building in the background. 2. Explosion at Eccles No. 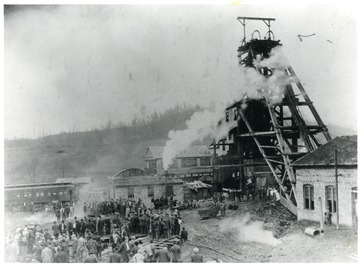 5 Coal Mine in Beckley, W. Va.
Explosion at Eccles No. 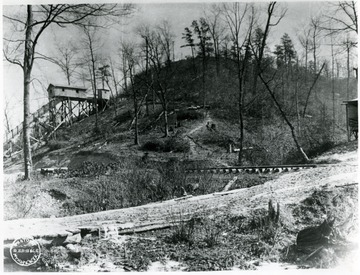 5 Coal Mine in Beckley, W. Va.
3. Explosion at an Eccles Coal Mine in Beckley, W. Va.
Explosion at an Eccles Coal Mine in Beckley, W. Va. 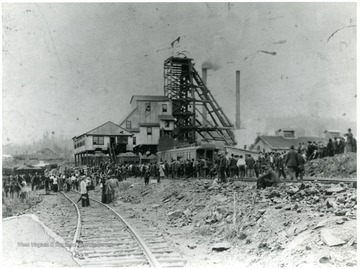 Crowds gather around the smoking buildings after an explosion at the Eccles mine. 4. 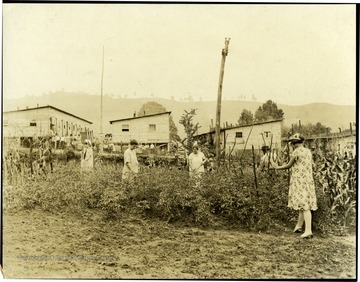 Women Working in Garden at Barrack Village Near Fairmont, W. Va.
Women Working in Garden at Barrack Village Near Fairmont, W. Va.
During Unionization of Coal Company workers, miners' families were evicted from Company owned houses. The Union supplied building material and land and the miners plus others constructed temporary barracks until the labor trouble was settled. Beside the barracks, there was room for small garden plots and here they are shown working in them. See New York Times Sunday Sept. 5th Picture Section. 5. 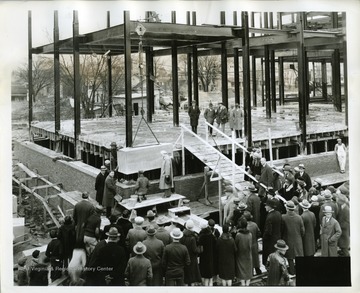 Cornerstone Ceremony at the West Virginia State Capitol Building, Charleston, W. Va. Cornerstone Ceremony at the West Virginia State Capitol Building, Charleston, W. Va.
People watch as the corner stone is set at the present day West Virginia State Capitol Building. 6. 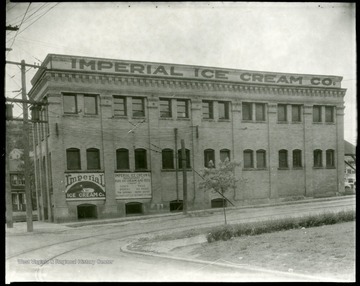 Imperial Ice Cream Company, Grafton, W. Va.
Imperial Ice Cream Company, Grafton, W. Va.
Imperial Ice Cream Business on the corner of Beech Street and McGraw Avenue in Grafton, West Virginia. 7. 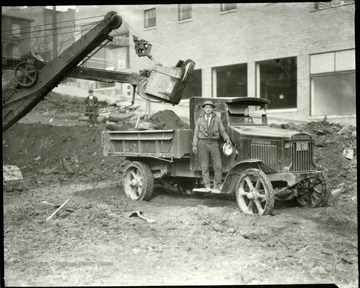 Construction on Site of Pure Oil Gas Station, Grafton, W. Va.
Construction on Site of Pure Oil Gas Station, Grafton, W. Va.
Man stands on runningboards of a truck that is being loaded with dirt. 8. 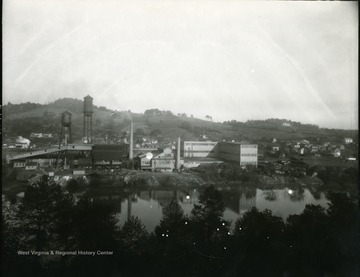 Hazel Atlas Glass Company, Fetterman, Grafton, W. Va.
Hazel Atlas Glass Company, Fetterman, Grafton, W. Va.
View of the Hazel Atlas Glass Company from across the river at Grafton, W. Va.
9. Cohen Building on Main Street in Grafton, W. Va.
Cohen Building on Main Street in Grafton, W. Va.
A Candy Shop is located in the Cohen Building on Main Street in Grafton, West Virginia. 10. 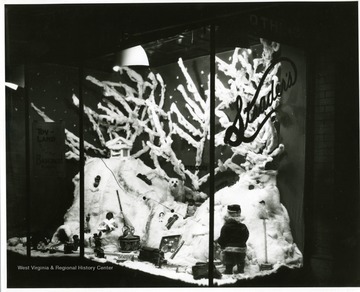 Christmas Window Display in Strader's Store, Philippi, W. Va.
Christmas Window Display in Strader's Store, Philippi, W. Va.
11. Custom Built Studebaker, the First Grand Capital Prize Given by the Grafton Sentinel Publishing Company, Grafton, W. Va. 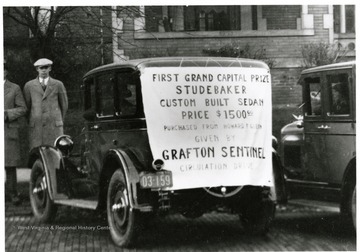 Custom Built Studebaker, the First Grand Capital Prize Given by the Grafton Sentinel Publishing Company, Grafton, W. Va.
Man stands behind a custom built Studebaker, the First Grand Capital Prize Given by the Grafton Sentinel during a circulation drive. 12. Custom Built Studebakers Awarded as Prizes by the Grafton Sentinel Publishing Co., Grafton, W. Va. 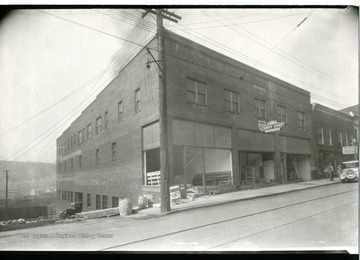 Custom Built Studebakers Awarded as Prizes by the Grafton Sentinel Publishing Co., Grafton, W. Va. 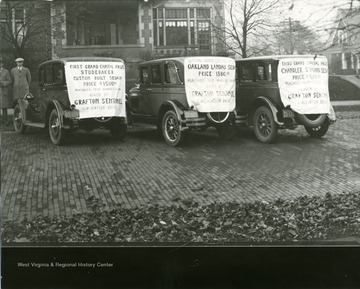 Custom built Studebaker, Oakland Landau Sedan, and a Chandler Standard Sedan, three automobiles given as prizes by the Grafton Sentinel Publishing Company during a circulation drive.